It is about Fun! And about Science! When you think about scientists, do you picture a mad man with frizzled hair, white lab coat, goggles, and holding a bubbling flask? Wrong. Get the REAL scope on science during the annual Fun with Science Summer Camp! The Fun with Science Summer Camp is a week-long camp where you will work with real scientists from Johns Hopkins! During the week you will work with microscopes, fluorescent bacteria, crystals, and mysterious smoke and more. You will discover how much fun there is in science, and how cool it is to become a junior scientist yourself! And, the camp is FREE! Lunch provided! How much better can it get? 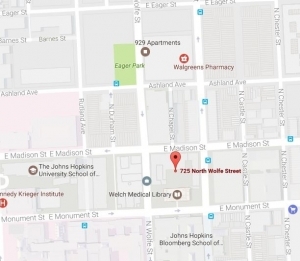 The camp is at Johns Hopkins Medical School campus. Parents should drop off children in the morning at 9 am and pick up at 4:30 pm at the curbside of: 725. N. Wolfe Street, Baltimore, MD, 21205 (corner of N. Wolfe and E. Monument St). If you are interested in science, going to 5th or 6th grade in the coming fall, and currently from one of the following local schools, you should register now! We only have 15 slots open this year, so first come first serve! Ask your science teacher about the Camp too. Schools eligible: City Springs Elem/Middle, Collington Square Elementary/Middle, Commodore John Rodgers Elementary/Middle, Dr. Bernard Harris, Sr. Elementary, Elmer A. Henderson-Hopkins Elementary, Fort Worthington Elementary/Middle, Hampstead Hill Academy, Harford Heights Elementary, Highlandtown Elem/middle, Johnston Square Elementary, Lakewood Elementary, Margaret Brent Elementary/Middle School, Patterson Park Public Charter, Saint Michael the Archangel School, Tench Tilghman Elementary/Middle, William A. Paca Elementary, and Wolfe St. Academy. You can check our past media coverage and video of the camp! You can also contact our camp coordinator Darcey McDowell at dmcdowe1@jhmi.edu with any questions you might still have about the camp. She can be also reached directly (410) 599-7093. We sincerely acknowledge the support (past and present) of the National Science Foundation, Johns Hopkins Office of Community Services, Department of Biophysics and Biophysical Chemistry, Institute of Basic Biomedical Research, The Idea Lab, Olympus, Inc., ThermoFisher Scientific, and the Johns Hopkins School of Medicine faculty and students community.